Last updated: Jan 16, 2019. 14:27 UTC. Domain Name Phishing is a scam that tricks the recipient into handing over the account login details. It usually involves the recipient being sent a genuine-looking email that asks them to log in to their Domain Registrar Account to check on suspicious activity, renew their domain, or verify their domain. The email contains a link to the login page of their Domain Registrar which is a duplicate copy. The recipient then logs in to the fake site and gives up their login details to the attacker. A slightly different form of domain phishing is where the recipient is tricked into downloading a file, such as a list of complaints or an invoice receipt. The downloaded file then installs malware which then collates confidential information from the recipient. In this article, I will take a look at why people fall for Domain Phishing Scams and what you can do to protect yourself. Finally, I will you through a Domain Name Verification Phishing Scam that I received myself. I’ll look at what made the email look suspicious, and how I verified that it was indeed a scam. Imaging clicking a link to your registrar, and upon landing, everything looks exactly as you remember it. Even the domain name in the browser bar is correct and has HTTPS. Some scammers are using Unicode Characters like “A” and “O” that look identical on the screen, but their Unicode value is different. KrebsonSecurity wrote a detailed article on lookalike domains. Our minds have two ways of thinking. Firstly, a fast, intuitive approach. Secondly, a slower analytical mode where reason dominates. These are the assertions stated by Karla Burnett, an engineer at mobile payments company, Stripe, at Black Hat 2017. In the video, she states that when you are busy and have to review a high number of emails in a short space of time, it is not reasonable to use your analytical brain all the time. Because detecting a scam requires your slower analytical mode, you are vulnerable to making an error. It is this chance of a mistake the Domain Phishing Scam preys upon. Phishing training at the moment is focused on getting people to look at URLs or hover over links, which require system two methods of thinking, not system one. Such training is only useful once somebody is already suspicious of an email, not beforehand. You can’t train somebody’s system one to think an email is suspicious when it looks exactly like every other email they’ve received. Some registrars send out emails with generic greetings, rather than addressing you by name. Because scammers tend to also send generic greetings, it may make it more likely that you will fall for it. Ever wondered why after registering a domain you are immediately bombarded with SPAM? Some registrars sell copies of their WHOIS data with basic information about your new domain, including registrant details. As of 2013, the RAA requires registrars to verify information in WHOIS. Verification is usually requested by email and contains a link to start the verification process. This familiarity of clicking links in emails from registrars may make recipients of scam emails more used to clicking links in emails about their domain. Ask you to confirm personal information, especially if the request is urgent. Try to intimidate or upset you by threatening you if you do not respond (i.e., your domain will go offline). Look for the green bar when logging into a site. In particular, look websites which have verified their company information (EV SSL). Enom, for example, is owned by Rightside Group Ltd, and this clearly shows on their secure pages. Do not communicate confidential information, or log into websites via email links. These could direct you to a malicious site that is built to look like a legitimate one. Do not communicate via telephone, unless you telephone them. 3. Do not Click Links in emails from unknown senders. 4. Beware of Links in emails that ask for personal information or to log into a website. 5. Secure your Domain Registrar account with two-factor authentification. The scammer will not be able to log into your account, even if your domain Registrar login details are compromised. I can’t stress this one enough. 6. If in doubt, email your Registrar directly for verification. If in doubt forward the email to the company it is purporting to be from and ask them to verify it is legitimate before auctioning. Most registrars now offer WHOIS privacy free of charge. Not only will you reduce the amount of spam received to your email address, but you will stop your registrant details being accessed by scammers. Many modern browsers, such as Chrome, will alert you if you’re visiting a page identified in a phishing attack. It can take time for such pages to be flagged so you may want to use antivirus software as well. Using a Spam Filter can help prevent Phishing Emails reaching your inbox. If you use cPanel or Plesk, then SpamAssassin is worth enabling. Otherwise, Gmail Spam filter does a reasonable job. No Spam Filter is perfect though, so don’t get complacent. I received an email from a company purporting to be from eNom. Enom is used by many web hosting companies to resell Domain Names, including Namecheap, although they have since started using their own Registry. The email asked me to verify my domain to prevent it from becoming inaccessible after three days. Your contact information XXXXXXXXXXXXXXXX@XXXX & +44.7901xxxxxx, has been set as the Registrant contact for a domain name registered through eNom. Firstly, the email was from a “tursagroup”, and the Enom domain had a suffix of “.ws”. Secondly, whenever I have been asked to review my domain contact details before I have never been asked to log into our account directly. This is your annual notice that all registered domain names must have accurate and updated contact information. Please review the domain information below and verify its accuracy. If all information is up-to-date then no changes are necessary. Inaccurate or outdated information must be corrected by logging into your account. Please remember that under the terms of your registration agreement, providing false or inaccurate Whois (contact) information can be grounds for the cancellation of your domain name registration. Thank you for contacting Namecheap Support Team! We would like to let you know that this email does not originate from eNom. We highly recommend you not opening the file and delete the phishing email. Please accept our apologies for the inconveniences this email might have caused to you. Should you have any questions, feel free to contact us again. That confirmed my suspicions and the email was then deleted. Many webmasters are currently receiving an email notice that their domain name visibility is at risk and requesting they purchase domain name search engine registration services. The subject matter of the email is “Domain Notification for xxxx.com: This is your Final Notice of Domain Listing”. These emails are a scam, and should be ignored. This Notice for: tabblr.com will expire at 11:59PM EST, 23 — November — 2015 Act now! Domain Search Engine Registration. © Screenshot. Spam from DomainRegList? Ignore scams like “Domain name search engine registration,” which nobody needs — your site shows up in search just fine without it. 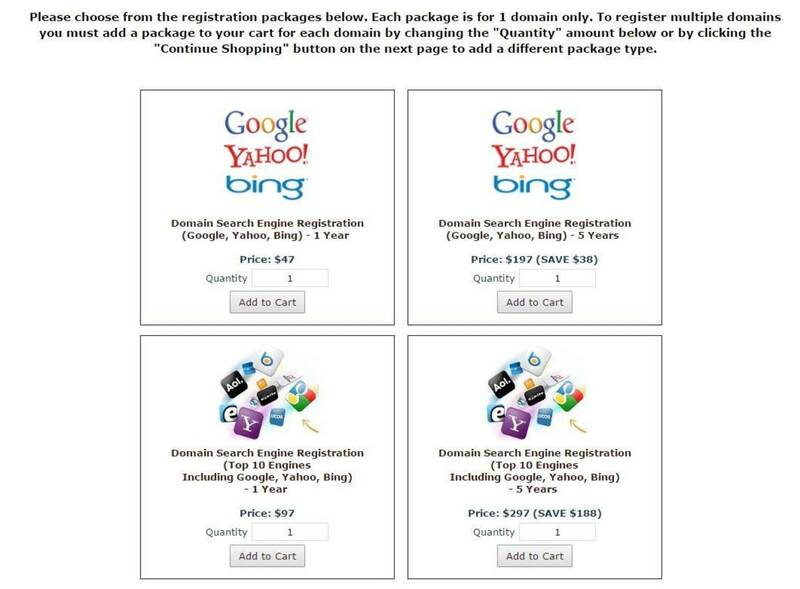 Search engine registration services are not required at all. Google and other search engines automatically crawl the web and add sites to their index. There is no need to register your site with them for your site to show up in Google.